Enjoy Brothers Grimm's Books? Tell us Why and Win a Free Book! Welcome to Brothers Grimm's BookGorilla Author Page! We're working hard to bring you the best deals ever on Brothers Grimm's Kindle books. If you’re a Brothers Grimm fan, we'd love to have your help in making this author page special. Tell us, in no more than 150 words, why you think Brothers Grimm is great. Use this webform to send us your submission, and if we select yours we'll offer you one of Brothers Grimm's books or a Kindle Gift Card as a free gift! Thanks! 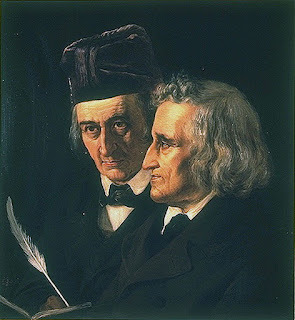 Image credit: Wilhelm Grimm (left) and Jacob Grimm (right) in an 1855 painting by Elisabeth Jerichau-Baumann. Please enter your email address and click the Follow button to follow Brothers Grimm! Classics by Brothers Grimm. Where do the king's beautiful daughter disappear to night after night? And who can solve the mystery of the twelve pairs of dancing slippers, worn to shreds by the morning?.. This edition includes illustrations never published before. Children's classic fairy tale of Snow White and the Seven Dwarfs. The book has 24 pages in full color book about Snow White, the loveliest princess of all and the Seven Dwarfs who are her friends in the forest. The famous fairy tale "Rapunzel" by Jacob & Wilhelm Grimm. Elves and the Shoemaker is a classic Brothers Grimm fairy tale of the early 19th century. The Brave Little Tailor is a classic 19th Century Brothers Grimm fairy tale.